It's a busy day here at the homestead. There will be all sorts of repairmen in and out all day, a medical appointment, firewood delivery and heaven knows what else. I am completely sick of having the black and white quilt blocks on the living room floor, so I am starting to piece them together. I started these blocks back in 2006 for my youngest son to take a quilt to grad school. Back then, he couldn't decide whether he wanted black or blue log cabins, so I made both. I bought an unbelievable amount of fabric and sewed log cabin blocks by the dozens. Eventually he decided on the blue, so I made them into a quilt for him. And I didn't get a picture, so you'll have to take my word on it that it did turn out quite nice. So this is why I had nearly all of the black and white blocks already made. Look at the way these are sewn together - quite a variance in size! I'm going to have to get the rotary cutter out and start whacking those extra pieces off. This is an extreme example, most aren't that bad. Since so much is going on today I've ensconced myself on our newly refinished dining room table which puts me close to the quilt blocks in the living room. It's going very, very slowly as I need to match up the pattern carefully. I've already had to rip out a few seams, which tends to put me in a not very good mood. If I'm careful, I can get most of this done this weekend. Wish me luck! But first of all, a picture of the doll with the hair bow. I love the embroidery on the face! It is just so adorable. There is no way I could have come up with the curlicues on the eye stitching or the spirals for the cheeks, but they really look like they belong there. I also like that the doll is fairly big, measuring 18 inches head to toe. The curly hair was constructed by knitting wool yarn then cutting it apart. But it really was a bit tedious stitching it on the head, so much so I had to get up several times to get away from it. But now that I think about it, I did have a flu shot that Friday morning, which made me feel somewhat sickly on Saturday and Sunday, when I was finishing the doll. So I'll blame my impatience on the flu vaccine. The bright colors of the dress are just what this doll needs, although you could make any sort of dress for it. I might just do that. A girl needs a change of clothes now and again. There isn't much I didn't like about this doll, except for the fact that the head seemed wider than the doll in the photo. I can't figure out why, as I followed the instructions and patterns very carefully and did stuff it firmly. Oh, I know what I didn't like - the boots don't fit. Try as I might, I simply cannot get the boots on the doll's feet. I may make a new pair that is shorter and larger, maybe even with a velcro closure or a ribbon at the top. If you remember, this pattern came from Country Bumpkin's magazine Inspirations, Issue No. 65. I have to say it is fairly typical of CB's patterns, absolutely adorable! There isn't much in their mags that I don't really, really want to make. Although I do have to say that this particular project is easier than most. Some can be quite challenging, but then that's the way we learn new techniques. Last week has not been a good stitching week for me. I have been stalling, doing a bit of this and that but not making much progress on anything at all. So to try to make the week more interesting, I'll show you a photo of a doily that my late aunt made which my uncle gave to me on our recent trip to Texas. This is a string cotton crocheted doily, with lots of texture in it. All the petals in the outer scallops are three-dimensional. When I first got this I thought it was a beige doily, but after soaking it in detergent and oxygen bleach I discovered it was white! After washing, I starched it fairly well, then laid it on a padded surface and kept working it with my fingers until it lay flat with no bunching in the middle area. I kept gently pulling on the scallops and flattened the flower petals until they surrounded the centers nicely. Now this is not No. 10 bedspread crochet cotton, it is much, much finer. It looks as though it was made with tatting thread, which is extremely fine and is rated as No. 30. Does this make it three times as fine as the No 10? Does anyone know? I certainly don't, but I do know that I don't want to try to crochet with it. After all, my recent crocheting projects are the first time I've picked up a need in over a decade. A new week begins, so what to do? I did start on the black and white quilt for my son, but as it drove my absolutely nuts after sewing just a few blocks together, I decided it could wait on the living room floor a bit longer. After all, it's been there a month already. I think I'll continue working on the hideous green afghan until the yarn is gone, then find a nice embroidery WIP and work that. It's so very nice to finish a project, it makes one feel so, well, virtuous. This project is from Inspirations No. 65, created by the very talented Susan O'Connor. I started the face when we arrived back home from our road trip, and have finally finished the embroidery, stitched the body together and then attached all the hair. Isn't she gorgeous? My husband says we should wait for a few years to give to our granddaughter, so she'll be older and better able to take care of it. I'm inclined to give it to her now. It really didn't take that long, and all the fabric and embroidery is cotton, not expensive silk. Besides, what's a doll for but to play with and drag through the mud? I still love those lips. Now it's time to find another project to work. The log cabin quilt has been on the living room floor for four weeks now, so it's time to get sewing. But I'm itching for a real embroidery project! The doll didn't have that much embroidery in the face, so it wasn't enough to satisfy my embroidery cravings. I am very much inclined to finish some of the the projects I've started, so I'll rummage through those and come up with something. Maybe I'll sew blocks together for a few hours, then stitch some embroidery. Sounds good, don't you think? I'll let you know what I come up with. Finally - back home again. We visited an uncle in Texas, our daughter and her family in Colorado, then made it back home Tuesday afternoon. We drove over many miles of flat, parched land, through the Rockies and the weirdly gorgeous rock formations of Utah. Much of it was breathtakingly beautiful. As much as I love Southern California, it was the ugliest part of the whole trip. As we came into the San Bernardino area the whole land was covered with a thick haze. Not quite smog, but still not very nice. I'm working on stitching the face for the doll I'm making from Inspirations No. 65, described in the post from Labor Day Weekend. I had planned on taking it with me, but at the last minute decided that embroidery in the car would not be a good thing. Too many bumps and interruptions for navigation to really be able to place the needle exactly where I wanted. So instead I've been obsessed with crocheting these washcloths. This is the one I mentioned that I ran out of yarn and had to buy a new skein to finish the scallop border. It only used a bit of yarn from the new skein so I will make a round washcloth out of the rest. This one was easy! All single crochet - I can handle this pattern. The next one I made was a knitted basketweave pattern that the pattern said was easy, but I've totally messed it up and am considering my options. I'll post on that one after I figure out what to do, but it will probably involve some serious de-knitting. So here is the face of the doll I've been working on since I've come home. Not much progress, but don't you love those lips? I have a three day weekend ahead of me, so I hope to finish it soon. The left eye is a bit lopsided, but should smooth out a bit once I finish the embroidery. I did finish knitting the yarn for the hair, and even started to take it apart. The wool is maintaining its shape so the hair will be very curly. I'll show you that soon! While on our road trip, I've been working on a few crochet projects while my husband is driving and I'm not navigating. I haven't really felt much like writing posts while in hotels, and have not had access to the Internet while at my uncle's house in Comanche, Texas. But we are now at our daughter's house in Colorado, so I thought I would post a quick one. As I mentioned in the last post, I brought some old green yarn to crochet into an afghan using the tutorial from Hooked on Needles. I took the photo with the iPhone, and in the light here you really cannot appreciate how awful is this shade of green. I brought three skeins and used them all, so it's been thrown into the suitcase to await my arrival home to finish it off with whatever I have left. I will try to find some new yarn that can coordinate with it to make it into a useful size. I didn't realize how quickly the crocheting would progress, so I picked up several skeins of Lily Sugar 'n Cream cotton yarn to make into dishcloths. Here's the first, very irregular I must say, but I am getting a bit better. The next one looks much more even, but I ran out of yarn on the finishing so will wait to post until I finish it. I'll be home next Wednesday, and should have more progress to share. My husband and I are leaving today for a road trip - almost two weeks long. We will first go to Texas (that's the state flower, the bluebonnet, above) to visit our uncle on my husband's side. We will be in a very small town called Comanche, somewhat south of the road between Abilene and Dallas. Then we go to Loveland, Colorado to visit the unbelievably beautiful granddaughter and her parents (my daughter and son-in-law). 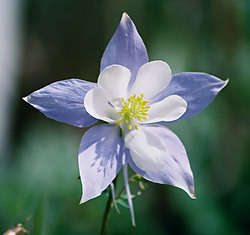 The photo above is the state flower, the columbine. 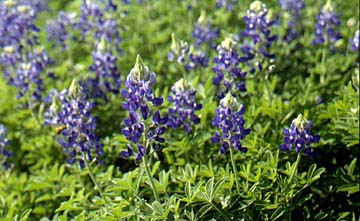 I actually have two of these plants in my garden (and one flowered this year). 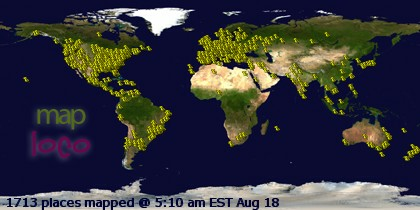 Most of the hotels we will be staying in do have internet access, so I may be able to post, but am not sure. We keep all of our photos on the Mac at home, not on my work computer which is what I'll be taking with me. But I do hope it will not be too difficult to figure out how to load photos onto a PC. I just need to remember to take the cord to connect the camera to the computer. Now I have to go and hem my new blue jeans. I'm using the excellent tutorial from SewNso's blog. As I don't have a serger I will have to use the alternate method of finishing the seam. Oh by the way, I am taking a few projects with me to work in the car while I'm not navigating and am sitting in front of the TV in the hotels. I will be knitting the hair for the doll I mentioned in early September. To keep me from being terrifically bored, I found some yarn in my stash in the most horrible shade of green which I will make into an afghan using the instructions from this post on Hooked on Needles. I haven't used a crochet hook in over a decade, and was amazed at how easily it came back to me. If I can manage to take a picture of it without fainting, I will post it. So wish me safe journey, and I hope to post on the way. If not, I'll be back online on October 13.